It’s been a minute since I blogged here! Being a working mom means being busy and having limited time and energy pretty much.. always! I’ve been trying to find ways to jazz up my mealtime, but still eat fresh, healthy foods cooked at home instead of pure convenience foods. I LOVE how this little experiment turned out, so I had to share! I was craving french toast, but didnt want something that heavy or sugary. I was trying to work with ingredients we had in the house, and I wanted it to have enough protein to balance out the carbs. I actually thought of the idea of french-toasting the tortilla because I wanted the tiny bit of extra protein that tossing it in egg added. Delicious take on french-toast, lower sugar and lower carb than the traditional option. Whisk egg in a bowl and add vanilla. Dip tortilla in the egg mixture, let extra liquid drip off. Place tortilla in a heated nonstick pan (optionally, can use nonstick spray or butter to prevent tortilla from sticking). Let tortilla cook about 30 seconds per side. Remove tortilla from pan and top with peanut butter, bananas, and blueberries. This fast and simple breakfast can be jazzed up with any toppings you prefer! Add chocolate chips or chocolate syrup for a sweeter treat. 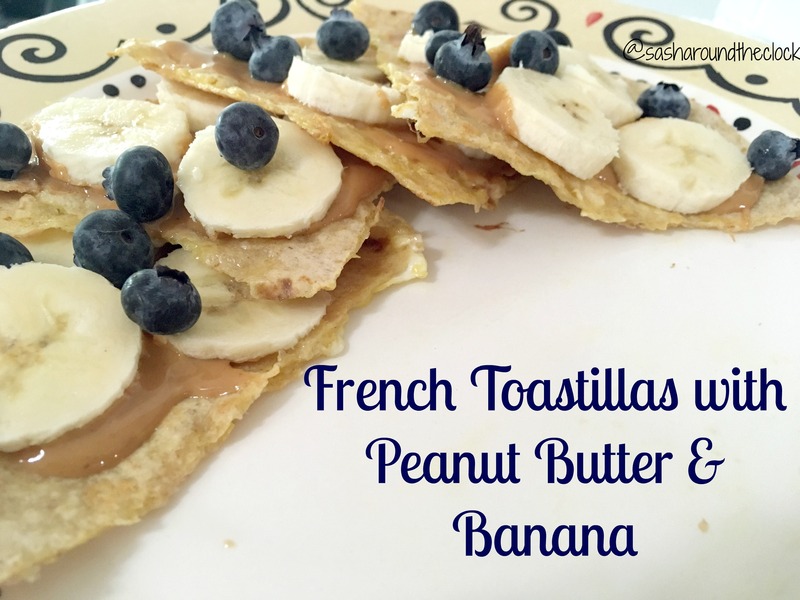 Stick with just peanut butter and bananas for a more traditional taste!